Prevention is a crucial cornerstone of dental care, and one that your trusted Los Alamitos dentist, William C. Poe V., DDS, and his dental care team take very seriously. With the help of our family dentistry services, including in-depth dental check-ups, thorough teeth cleanings, and small restorative treatments such as fillings, we can ensure the health of your smile and treat any potential issues (such as cavities or chips in the enamel) as quickly and effectively as possible. When it comes to our patients, our team knows it’s important to create a solid foundation for both exceptional oral health and beauty. Once we’ve helped you achieve healthy teeth and gums, we can start improving their visual appearance as well with cosmetic dentistry services. 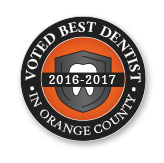 When you’re ready to get started, call Dr. Poe and his team to schedule an appointment at our dental office in Los Alamitos. Preventive dental care is all about preserving healthy dental structures and catching oral health concerns before they have a chance to damage your smile. That’s why the foundation of any good preventive dentistry plan is regular dental checkups and teeth cleanings. As recommended by the American Dental Association, we encourage our patients to visit us at least twice a year for a checkup and professional teeth cleaning. During your checkup, we’ll capture diagnostic images, visually examine your smile for warning signs of oral health concerns, and provide a thorough cleaning. Additionally, we’ll be happy to answer your oral health and hygiene questions, review your at-home hygiene practices, and partner with you to create a plan that ensures you’ll achieve and maintain the healthiest smile. We know that families are busy, and it can be a real struggle keeping up with your dental checkups and scheduling appointments for kids at a separate dental office. Dr. Poe and his team are firm believers that dental treatment shouldn’t be stressful. That’s one of the main reasons why we offer family dental care. You can schedule appointments for your whole family right her in our dental office where your little ones can develop healthy, happy smiles through the guidance and gentle care offered by our Los Alamitos family dentistry team. For young patients and adults struggling with chronic tooth decay, dental sealants can offer a fast and effective solution. This simple treatment can be completed as part of any dental checkup. We simply apply a thin coat of sealant material to the surfaces of teeth. Then, a curing light is used to harden it into position. Once in place, your dental sealants will be completely clear, so no one will know they’re there. These clear coats of sealant provide a physical barrier between your teeth and decay-causing bacteria and plaque.